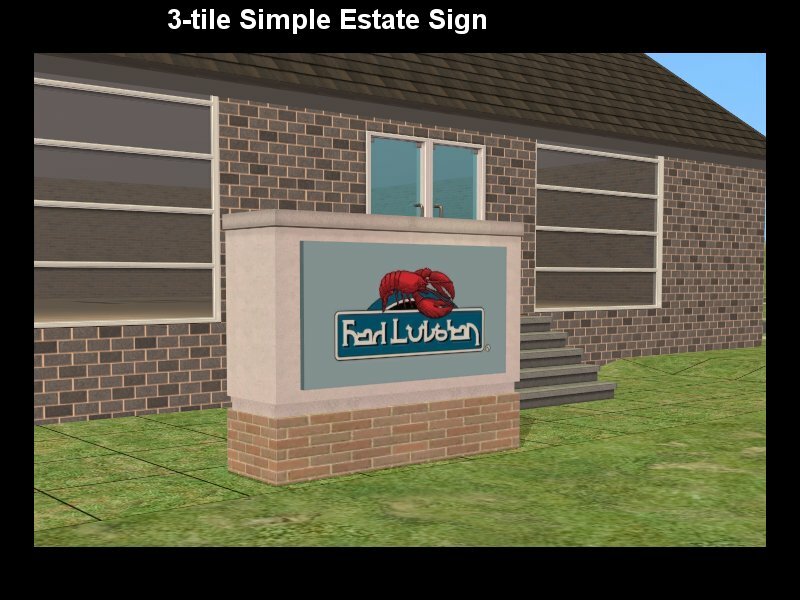 So this is what I've got - which (I hope) is a 2 tile sign, 1/2 wall high. I've realised I've forgotten a lot. (As in almost everything). I went looking for a texture editor help, and found a very old one at chumbalum - but it doesn't reflect the current texture editor. I want to map the top of the wall and the sides/top/bottom of the sign, separately to the front/side/back. Currently I have them in 2 groups, 1 wall, 1 sign and assigned to the same material. I want it to have 2 subsets so the wall and sign can be recoloured separately. Have as yet to find a similiar sculpture of 2 subsets and 2 tiles but I'm sure there is one out there. Question 1: Can I have multiple groups in a subset? It appears that the milkshape texture editor only maps per group. Or alternatively, Can I group them into one group after I've texture mapped them, and would the texture mapping remain the same? Question 2: Is there a bright, new shiny tool that will let me map this the way I want to? Q1: Yes you can. The only rule is that all of the groups must share the same texture. Milkshape does allow for the texturing of parts rather than groups after the texture is applied (just select [FACE] the part of the group you want to retexture and press Ctrl+T and choose the group. Only the selected part of the group will appear in the texture coordinator and you can remap it any way you see fit. Q2: You can try UVMapper, but I started with that before I learned of Milkshape's own mapper and found it to be more trouble than its worth. I think if you're designing in Milkshape then Milkshape's texture coordinator (CTRL+T) is the best mapper as you can map anything pretty much anyway you like due to its integrated feature. 3rd party apps usually require saving and resaving the object file and it starts to get confusing and troublesome when you have several working versions. Q3: I believe you can have a 512x768 texture if you build it in SimPE because I've seen a Maxis texture with weird scales e.g., 128x72. I prefer to stick to the 8x8 formula and use GIMP for fixing skewed pictures. I don't understand why your texture is being stretched on your object though. ??? Did you scale it in the texture coordinator to the image? Also if your image is as simple as the link, I'm not sure why your texture needs to be this big anyway. Wouldn't it be better to do a 128x128 or 256x256 texture? If you don't mind posting your texture or object, I can take a look at it for you and screenshot the texture coordinator steps. Hi Nanashi - Thanks for that, I'll definitely take you up on that. I'll keep going with Milkshape Texture coordinator. 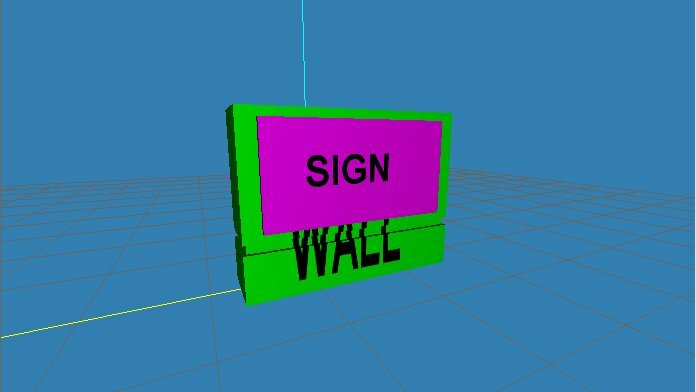 I have a single texture for both subsets - both bits are 512x256, which is fine for the sign, but stretches on the wall. I want 512x256 for the sign to allow some complexity, the knox elementary sign is simple - but the person who's going to use it, is going to do their own sign which tends to be far more complex and the problem with the smaller textures is that it has a lot of problems with fine lines - they tend to blur and look pixellated. The wall texture could be smaller, in fact it would make more sense for it to be smaller - because I want it to match the wallpaper sizes - 256x512 but it's a half-wall, so 256x256 would be more worthwhile. Wallpaper textures are stretched it's 256x512, but a wall is actually 256x768. So yeah, I'm working on the basis that I want the quality of wall texture to match the wallpaper on a standard wall. The Wall front 256wx256h, and the spare 256x256 to be used for the indented bit in the wall, the top of the wall, and the sides of the sign. Thankyou again for helping me with Nanashi! What I would do - is I would break the mesh into a couple more pieces (and add a top) and then map the pieces. Two textures and two subsets is how I would go with this: one for the sign, one for the wall. I would take a maxis wall texture and take off the bit I need and map to that. A mirror mesh on the wall would work best to keep texture small yet detailed. On the sign I would go with a 512 by 384 as it is two tiles wide. I would map one half BEFORE I mirrored the wall. The issue with milkshape is that the mapping per face per group is from front back top etc. So the best way to deal with it is to break the groups down into faces and map those faces from front back side etc and then regroup. So for the foot of the sign I selected ONLY that box. Then I hit regroup so I was working with only that. Hide all the rest, swap to select faces (no vertex) then select the front and then map the front back from the front, swap to the rest of the box - which should be the two ends, remap from the right (or left...). Rinse and repeat. You can see my final map attached. Ahhh ok - that makes sense, Lee. That's what I will do. I will try that out in the morning. Yea, the texture I used is an edited version of my london arches fence texture; its a 512by 512, but given the height and width of the sign walls I would go with that. I didn't write any explanation with the screenshots, but they should be in order so you can click through them. Sorry, I wish I had the time to make a proper tutorial, but maybe later. Basically, I did the steps that I mentioned earlier. Selecting parts and re-texturing them, occasionally regrouping when easier. However after I made the template match, I realized that mapping with a template isn't a great idea. So I re-did it to look like the sign you provided a link to. 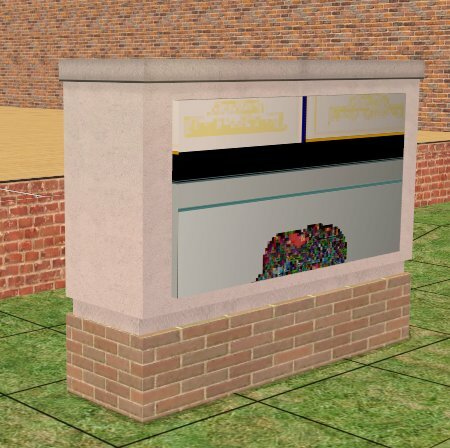 I would recommend avoiding templates because you won't know what you really want to do until you see how the actual texture looks on the mesh. I usually build and update my texture as I build my mesh; it gives me more flexibility when I want to add detail to parts of the mesh. Since you are doing two subsets, I'd recommend making the sign subset 512x256 and the wall subset 512x256 and then adding a bump map to the wall. Hope this info helps. Thanks so much Nanashi - I've reviewed your edit and screenshots and they've been a great help. I've amended the file as per Lee's suggestion - and I'm much farther along now. But I think I can fix it. I've still got to add a bump map, and change the footprint to 3 pieces (because it turned out to be 3 tiles) - but it's in-game and it's not crashing. So that is a good thing. That looks pretty good kiri. It might be the DXT is not loading the odd sized png for the sign and so a remap might be needed to match it up to a more conventional size. Yeah, that's what I thought. It said that it couldn't detect the end of stream. I'm going to do that today, and then make some recolours to make sure I've done the package correctly.